DIY soft punk duo, DOLLS are set to launch their latest single, Audrey on 1st March. Headlining London's Old Blue Last on the same night, the single was moulded by producer, Rohan Budd and engineer, John Davis, who has previously worked with the likes of Led Zeppelin and Royal Blood. Consisting of Jade Ellins and Belinda Conde, Essex based Dolls share a similar yearning to the likes of Deap Vally, producing a raw gutsy performance both live and in the studio. 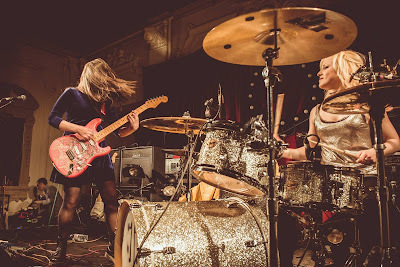 Accompanied by Kid Kannibal, we're shown a poetic potion of fire and angst, with a vocal harmony that could bring down a nation, their potent female touch has a bewitching feel. Get your copy of Kid kannibal / Audrey here.